There's a lot of buzz about motion media and video these days. It's hard to find a website that doesn't have some kind of animated graphics, video, or at least a slide show. Nothing has changed overnight: it's only the latest step in the evolution of media. But technology and a consumer-driven market has accelerated the rate at which these media are evolving and the ways in which they effect our day-to-day lives. The new media discussion has by no means bypassed the church. Mega-churches have been dressed up like a Super Bowl halftime show probably for as long as projection screens have been around. More conservative churches have been slow to jump on the big screen bandwagon, but the times are obviously changing, and even my small-town confessional Lutheran church is discussing whether (or how) to use video in the worship service. I can't answer the question myself, and I haven't found many discussions on various media in worship. But now is the best time to have them. A decade ago was probably too soon; a decade from now it will probably be too late. With video in particular, we aren't dealing with a medium that is totally new and foreign to us—just more accessible. We can literally pull a device out of our pockets and watch Justin Bieber's latest music video, or this week's episode of our favorite network sitcom. We can access music, video, and information at any time and any place. So is it realistic that we can find these media everywhere but in church? I'm not sure yet. But it is the people who aren't sure who will probably do the important research, search the Word, and proceed cautiously into uncharted waters. We have hindsight on our side—we can learn from the successes and mistakes of other churches in dealing with new media (not just video). The two easy mistakes would be to either put up barriers and resist any form of newness, or to charge ahead without any theological direction or regard to consequences. Yet again, I don't presume to be an expert on this subject. But since I deal with the visual arts in worship, the discussion is inevitably going to turn this direction. So perhaps I need to become more familiar with this. But for the time being, I can at least submit some observations and ask some important questions. Perhaps they will eventually help us avoid some of the many pitfalls that are lurking in the storm of new media ahead. "The content of any medium is the juicy piece of meat carried by the burglar to distract the watchdog of the mind" [McLuhan]. What he's saying is that the medium itself has a power, a bias, and a meaning regardless of what message you put through it. He's challenging the metaphor that we often assume: Media are simply pipelines, a neutral conduit through which information can be put through. I think it's crucial for Christians to begin to perceive the media forms themselves, rather than just looking at - and understanding - the content. We're too easily distracted by the content, and we miss the power of the medium. If media are not just "neutral conduits," then this obviously raises questions: What message is the medium sending over and above the content I want to communicate? Is it possible that this message is contrary to the message of God's Word, or to the purpose of worship? The interview that I linked to above explains how easy it is to manipulate people through video media. The reason TV commercials are so effective is that they easily stimulate the emotional functions of our brains and stifle the portions that make informed and logical decisions. Whether we intend them to or not, motion media have a high capacity for manipulating. That should make us at least very cautious in how we use them. 2. Faith Comes by Hearing the Word. God is truly wonderful in his works. He presumably could have revealed himself to us by visions, by giving us signs in the heavens, by e-mail, or perhaps by any other hundreds of media. But he chose something so simple that it has been accessible to little children, illiterate shepherds, and professors of law, in every age since the creation. It was written down to preserve its accuracy over the millennia, but it was transmitted orally for generations. God wants us to hear his Word. Regardless of what new media will appear 50 years from now—inconceivable to us now—that truth will never change. "Faith comes by hearing the message, and the message is heard through the Word of Christ" (Romans 10:17). This means that every medium will always reverse into some form of its opposite when it is overused. So for example, when the automobile, which is designed to increase speed, is overextended or overused, it actually reverses into traffic jams and even fatalities. We can see this law at work in "religion online." What may have been intended as an outreach with the gospel has become a crutch for laziness and consumerism. In addition, it turns the objective substance of the Word and Sacraments into little more than a subjective emotional experience. Check out these online videos (oh, the irony) by Jeff Hendrix that summarize some of the problems encountered in these media: Material Beliefs and Virtual Presence. We are best off when worship remains what it is and always has been: Christians gathering together in one place to hear the Word proclaimed and to receive the Sacraments. Technology will never change that. 3. The Church Adapts, But Cautiously. The Christian Church is not inherently indisposed to using new technologies. During the Reformation, the church was busily utilizing a recent (re)invention—the printing press.2 Since 1455, the Bible was being mass produced. Pamphlets were being circulated that discussed the theological issues at the heart of the reformation. Catechisms were distributed into the home for instruction. And collections of hymns were published and distributed as early as 1523. But the earthly church isn't infallible, either, and hasn't always wielded media appropriately. For instance, medieval morality plays and pageants quite probably began in worship contexts as "liturgical drama." What began as priests enacting the gospel lesson evolved into a costumed pageant featuring bastardized parables. By the time the dramas were transitioning out of the church and into the public, they had little to do with Scripture and more to do with spectacle. Does this sound at all familiar? Or consider another medium: sculpture. Art and theology have always enjoyed an intimate relationship in the church. 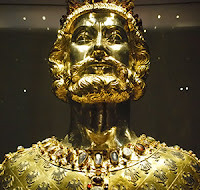 When the cult of the saints was at its height in the Romanesque and Gothic periods, every church—especially those on major pilgrimage routes—boasted of gilded, bejeweled statues and reliquaries of the saints. If the medium is the message, what does the medium say about the saint being portrayed? Does a golden statue containing a bone fragment say, "This was a person who submitted himself to Christ and the gospel," or "This is a holy figure who is worthy of your worship"? An argument could be made that the medium influenced the theology of the church at least as much as the theology necessitated the medium. Fast-forward to today. 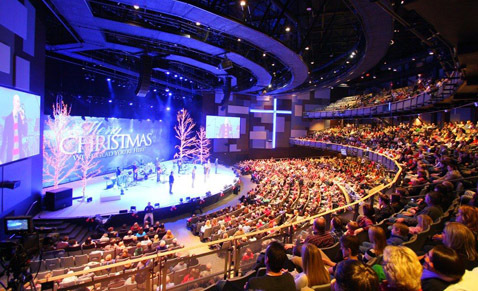 Pastors, musicians, and churches are working overtime to get video technology into the sanctuary. Some, because of a superficial desire to be seen as "with the times," and others, because they genuinely want to share the gospel in any way, shape, or form. For instance, the music group Koiné leads worship services that are a total audio/video experience, even including live sand art performances on some occasions. And from what I have seen, they appear to be very conscious that everything be as reverent and Christ-centered as possible. It would be hard for a person to go to a Koiné service and say, "This is disrespectful to God." It is that kind of caution and temperance that will make it possible to see what the liturgical potential is for these new media. It may be that some media are not appropriate in worship ever, because of a categorical contradiction between entertainment, for instance, and Christ-centered worship. It may also be that some media will grow out of their common associations that might currently prevent them from being used in worship, as has occurred with certain instruments. (The difficulty with that thesis is that in order for something to "grow out" of its secular association, it presumably has to be used in sacred settings before that point has been reached.) And it may be that some media are appropriate in worship, but must be used cautiously. I think any medium has to be sanctified—set apart—and considered in light of Scripture before it is imported into worship. Because just like the structure, music, liturgical articles, and everything else we use in worship, it is being used for a new and special purpose. That's part of our historical understanding of being "not of the world" (John 17:16)—we don't cut-and-paste secular culture into our sacred culture of worship. I didn't promise to provide an answer to the question of whether video is appropriate in church, and perhaps I'm not any closer to getting one. But at the very least, it cannot hurt to begin having informed discussions about new media and their use or misuse in worship. I think that with careful study of his Word and prayerful consideration, the Holy Spirit will guide our actions as he has in the past. 1 The title is a triple pun on the words message, massage (which describes what media do to our brains), and mass-age (that is, the age of mass media). 2 It is commonly overlooked that the moveable type printing press had been in use in China since the 11th century. But...we have to be careful to say what it is actually affecting. Media cannot make the word of God any more effective than it already is. Media is not a means of grace (Though some contemporary theologians would disagree). So what are we using it for anyway? I suppose that would be the same reason we use music (or at least, used to use music). There is something that music does, to aid in remembering, in influencing us, in stirring the emotions. Video does the same thing. Hymnody has always balanced that emotional connection however, with a didactic text. Good hymns teach/proclaim as well as move the emotions. Many would say that video does this now. I think its actually filling a void of a lack of good music, or at least filling a perceived void, one created by contemporary Christian music which says "just feel the emotion, and if you don't feel it now, keep listening to more, and then why not put video in church to help out..."
How much are videos actually teaching/proclaiming versus suggesting? No one watches a movie (unless you actually like movies like "Facing the Giants") that preaches to you. It doesn't appeal to our post-modern way of thinking about things. So, the result of most movies ends up being something like, "well, what did YOU get out of it?" Very different than a hymn which teaches the faith. On the other hand, PowerPoint is used exclusively to teach. I find very little emotion at all in PowerPoint sermons. PowerPoint was a classroom/business tool that the church borrowed. So for these churches, the sermon has become a lecture, not proclamation. So, I do think video can be used. But, like you say, it needs to be done cautiously. Unfortunately pragmatism has killed being cautious, and most churches which have introduced video have already sailed off the deep end. If you want to do an interesting case study...look at the churches which started showing the WELS Connection. Most started out showing it on small TVs, maybe in church, but not necessarily. Over time, churches put in screens to show it, then they thought, "what else can we use this for?" I'm fairly confident that WELS has far more projector screens per churches than LCMS, perhaps even ELCA. Actually, I do think 10 years ago is when this discussion should have happened. One more thing: I think religious motion media has a much better place online. Just watch Pastor Fisk's Worldview Everlasting videos sometime, and you'll see what I mean. They supplement the Divine Worship Service...they don't take it over. I think that is a way we can actually combat laziness. Imagine: Using the Historic Lectionary, a pastor has a fairly set "topic" each week. One sunday, the pastor preaches on prayer. Obviously he can't treat everything in the sermon, and the Bible Study time is reserved for something else. So he made a short vlog or blog the week prior, and at the end of the service he directs congregation members to the website to watch/read it, and SHARE it. He maybe even tells the congregation to tweet about the service (afterwards of course). This way, they are sharing with others, teaching them, all while not falling into the traps of church growth. Oh yeah. I had intended to include Jonathan Fisk in my post, and it slipped my mind. I suppose it got long enough, anyway. But I agree with you. I think webcasts and vlogs are best used as a supplement to the service, not as a substitute. This is a really interesting post and great follow up Jeff. I agree with a lot of the points you bring up and there are some amazing questions brought up as well. I really enjoy how you brought up the printing press and how that changed the everyday persons ability to access The Bible. Now, I teach at a fully online school and I see it everyday the way that something I teach about can be recorded and then put together with other resources/videos and then posted somewhere for a student or someone to watch at really any point in time. The nice thing is I don't have to spend the time repeating myself and I can really focus on the content of what I am teaching and how to make it visually appealing. I am not sure if I have a strong opinion about the video in the service and I think there is a good variety of different approaches that I have seen. I personally have loved seeing and would continue to want to see more use of video in regards to just bringing Gods Word to our daily lives more. The same idea of my online teaching of bringing together the best resources/videos and putting them in a place that is very accessible and interesting is something I would love to see more of. A few of my family members and friends watch videos from Mars Hill Church http://marshill.com/ and I continue to be blown away by the amount of great sermons/content there is all in one place. I am not suggesting this is a substitute for Sunday Service, what I am saying is why not have something Media/Video based that is one of the focuses for Monday-Saturday. Those are my thoughts, and when I am referring to videos I am referencing well put together videos with visually appealing shots. How many AMAZING sermons are there out there that could be Video recorded and shared? I saw a stat that the average American watches 5 hours of TV a day. What that says to me is that most people will literally watch anything with a story so I feel like we should take the opportunity to produce more things about The Story!